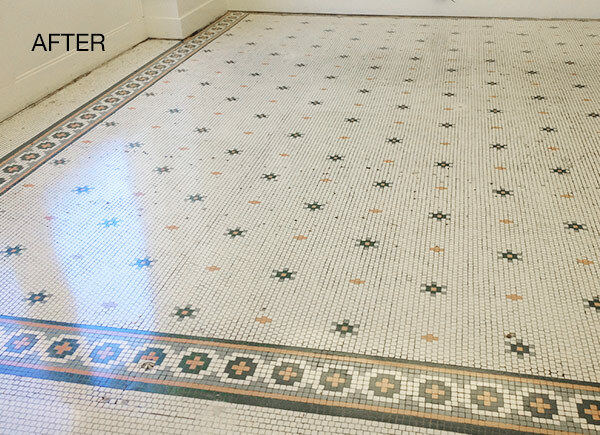 Installed in 1910, this granite and verde green marble entrance and porcelain mosaic dining area floor had been covered with VCT tile and cement. On top of the tile, carpet had been installed. 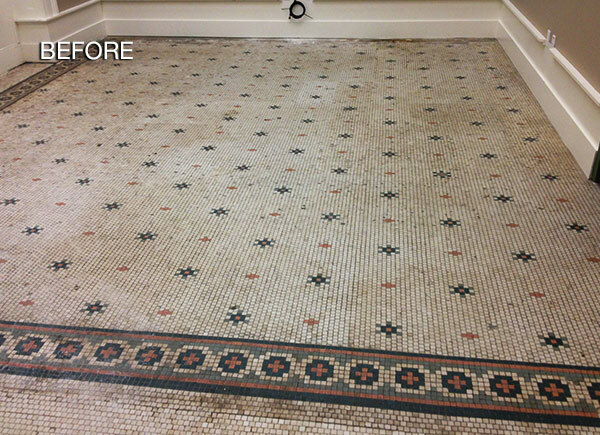 A contractor removed the carpet and tile to reveal the stone floor underneath. The Nashville, TN homeowners wanted to keep the original floors, but as you can see in the BEFORE images, they were in very poor shape. The tiles were not level, and in some places tiles were missing. Our first step was to aggressively clean the carpet glue from the floor’s surface. Then we replaced the missing tiles and performed a grind, hone, and polish. Grinding the floor leveled the uneven tiles. 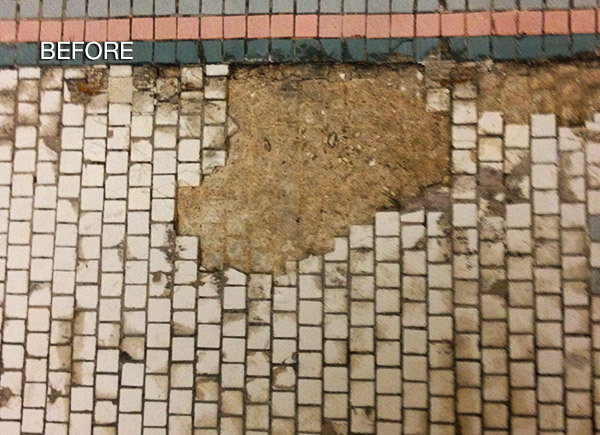 In the stone and tile industry, this process is called lippage removal. 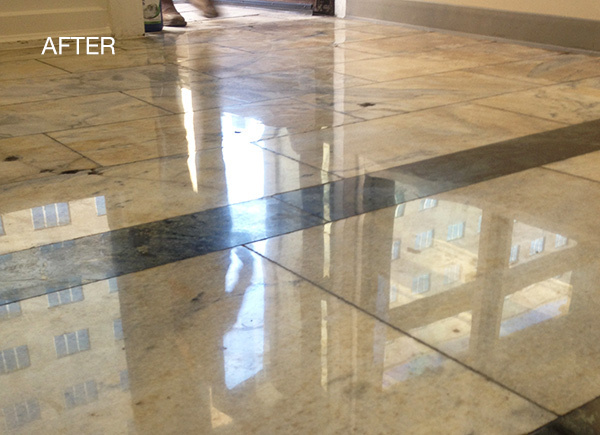 The honing process made the floor smooth and removed any marks caused by the grinding process. 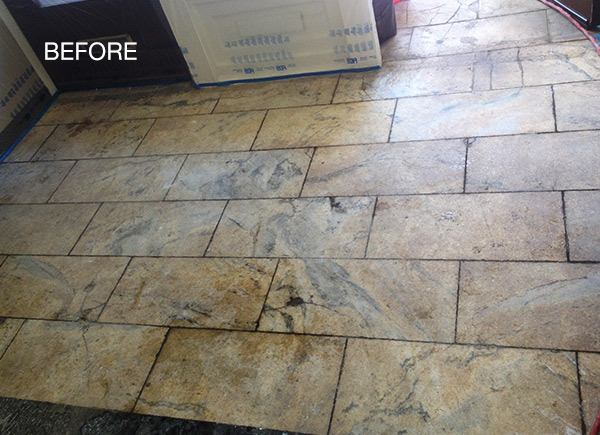 The polishing process was the finishing touch that gave the floor the clarity and shine you see in the AFTER images. 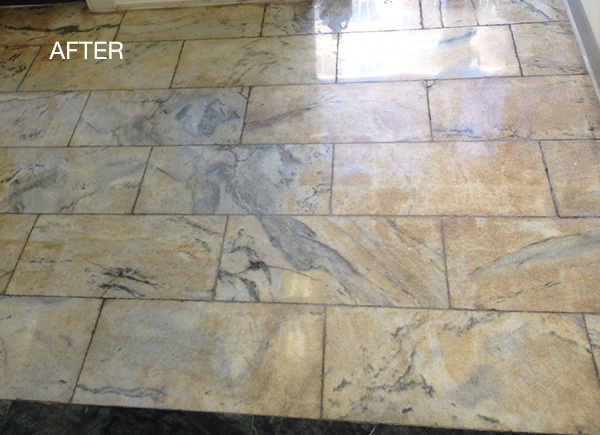 Visit our Marble Services page or Granite Services page to learn more about stone restoration. For a free estimate on marble, granite, or other natural stone polishing, repair, or other services throughout Tennessee, including Nashville, Memphis, Knoxville, Murfreesboro, Clarksville, and Chattanooga and surrounding areas, contact us online or call (615) 351-4676 today.